There are more than 75 species of milkweed native to North America. The Growing Place carries seven kinds! The botanic name of common milkweed, Asclepias syriaca, comes from Asclepius, the Greek hero of the medical arts. Syriaca means ‘of Syria’ a mistake made by Linneas when naming the plant in 1753. The species is native to North America, but he observed a crop experiment in Syria. Milkweeds are named for the milk-white sap in their stems and leaves. This sap contains sugar, gum, fat and other compounds that are acidic and somewhat poisonous to animals. By feeding on milkweed leaves and ingesting the sap, monarch caterpillars and adults become distasteful to birds. The strong, sweet fragrance of milkweed attracts a wide variety of bees, butterflies and moths. Milkweed seeds are dispersed by wind and sprout freely. 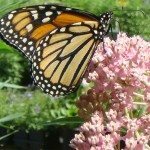 The roots of butterfly weed, Asclepias tuberosa, have a long history of being used by Native Americans as a medicinal herb to treat chest complaints and a variety of other illnesses.